From his high school days into the 1950s, Fidel Castro familiarized himself with the writings and activities of José Martí, among other 19th-century Cuban fighters for social justice and independence from Spain. Fidel read all of Marti’s 28 volumes. He also studied the works and practical activities of Marx, Engels and Lenin. He examined and held a deep respect for the Bolshevik Revolution. During this early period of his remarkable autodidactic evolution, he lived and was politically active not only in Cuba but secondarily in other Latin American countries, such as the Dominican Republic. The revolutionary traditions and thought of the entire region also entered into his mindset. It consumed his thinking as well as his very political spirit as a rapidly evolving revolutionary ready to give his life for the cause of the humble. This thirst for familiarization with different strands of Cuban and international political thought and action carried on throughout his life. Fidel’s legacy, among many other features, lies in his singular capacity to link theory and practice. He did so, taking into account the historically unprecedented longevity of his political journey, like no other revolutionary of the 20th and early 21st centuries. Gabriel García Márquez, an icon of Latin American thinking who personally knew Fidel very well, wrote that Fidel is the “the anti-dogmatist par excellence” (“A Personal Portrait of Fidel Castro.” In Fidel Castro, Fidel: My Early Years, Ocean Press, Melbourne, 1998, page 17). It is worthwhile to stop and reflect upon this evaluation of the extent of Fidel’s anti-dogmatism. Che Guevara lived and fought with Fidel Castro in the centre of the Sierra Maestra and after the 1959 triumph. In Bolivia, on the July 26, 1967 anniversary of the attack on Moncada, Che wrote in his Bolivian diary about the “the significance of July 26, a rebellion against oligarchies and against revolutionary dogmas” (Ernesto Che Guevara, The Bolivian Diary of Ernesto Che Guevara, Pathfinder Press, Montreal, 1994, page 239). Yes, you read it right: “revolutionary dogmas.” Fidel and the movement he led were forced to go against the tide of the dominant left at the time in Cuba by opening up the path of armed struggle with the attack on two Batista barracks, including Moncada. Thus, this rebellion was also a revolt against this older left, which was not able to seize the historic moment. Moncada was not, from the point of view of the left, “politically correct.” Some of the left, both in Cuba and internationally, slandered Castro as a “petty bourgeois putschist” for his groundbreaking Moncada rebellion. It was supposedly not justified by the followers of Marxist “manuals,” seen by them as dogma fixed in time and space rather than as a guide to action. Fidel turned revolutionary thinking and practice on its head. The strategies and conditions of the Bolsheviks were not the same as those existing in Cuba in the 1950s that led to the Triumph of the Revolution in 1959. Nor is the situation in Cuba the same now as it was in 1959. Only a revolution purged of dogmatism, such as the Cuban one, can navigate through a world in flux. In the 1950s he rallied the recalcitrant left trend in Cuba to the cause. He did so through his July 26 Movement’s actions, spirit of self-sacrifice and new political thought. The latter was manifested in his “History Will Absolve Me” speech that was his defence in the trial following his capture after the failure of Moncada. All of these factors combined shook Cuba to its very foundations, a result only a self-reliant thinker and his collaborators could produce. The rest is history. Or is it? No. How many times did Fidel Castro go against the tide and lead Cuba out of a dead-end disaster? As just one illustration, he refused to go along with Mikhail Gorbachev’s reforms and capitulation to the U.S. in 1991. In fact, he actually foresaw the crumbling of the U.S.S.R. two years before it took place. Where is this requisite life-and-death resistance and defiance explicitly expressed in any of the works of Marx or Lenin or José Martí? Yet these political figures all exude the principles, thinking and self-sacrificing devotion to the cause of the people that are applied to such unforeseen challenges. Nevertheless, even with this heritage from the 19th and very early 20th century, in the threatening and stormy uncharted waters between the late 1980s and 1991 the Cuban revolutionaries had to figure out the way forward by themselves. The U.S. was waiting in the wings, licking its chops at the prospect that Cuba would fall into line. Where would Cuba be now had it not made the break at that time by again remaining faithful to its anti-dogmatic tradition, thus allowing new ideas and orientations to guide it? Thus, Fidel’s legacy lies in his capacity to link theory and practice, or practice and theory, through the concrete analysis of concrete conditions. “Analysis” presupposes a theoretical outlook, true; however, this perspective applied to “concrete conditions” means paying attention to the real world and seizing the moment based on the needs and aspirations of the vast majority of Cuban people at any given time. The capacity to intrinsically and consistently marry the two, theory and practice, makes for a revolutionary such as Fidel. Some may say that by dealing with this exemplary leadership of Fidel on theory and practice, one falls prey to individualizing Fidel and thus personalizing the Cuban Revolution to the detriment of the role played by the people and his closest collaborators. However, nothing is further from the truth. Where does the success of concrete analysis of concrete conditions find its source if not in the people? Concrete conditions correspond to the humble people and their ongoing movement. Both theory and practice are inseparable when it comes to Fidel. In addition to this lesson of method, its actual concrete manifestations as found in his pronouncements on myriad domestic and international issues are part of his legacy. For example, in 2001, he said that “Revolution means to have a sense of history; it is changing everything that must be changed.” This provides Cubans with a daily political practical orientation. Likewise, he said in 2005 in the context of dealing with domestic problems that “This country can self-destruct; this Revolution can destroy itself, but they [foreign powers] can never destroy us; we can destroy ourselves, and it would be our fault.” On the complex issue of Cuba–U.S. relations, since December 17, 2014, Fidel expressed his opinions on several occasions. They are not only pertinent but necessary to guide Cuba’s policy today and in the future, as well as to provide the consciousness to progressive people all over the world regarding this contentious international preoccupation. One cannot overestimate the role of the individual in history, but it is as misleading to underestimate it. For example, Charles Darwin was a naturalist who posited the theories of evolution and natural selection. He broke the mould by studying the existing works of other scientists with whom he consulted and, most importantly, by analyzing nature on his own. Similarly, Marx followed this path to make his discoveries in social and political thought. While I am not comparing Fidel to Darwin or Marx, as he would be the very last to condone such an unjustified comparison, the principle of the individual’s determining role in opening up hitherto unexplored paths by linking thinking and conditions applies to Fidel. He is an outstanding archetype of the 20th century and even well into the 21st century as his thinking and example will be applicable for at least several decades more in this century. 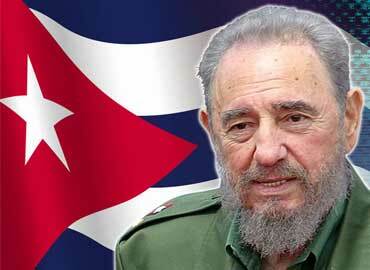 Fidel was a political figure who thought for himself. However, his approach was based first and foremost on revolutionary principles. He was an anti-dogmatist par excellence in whom theory and the practical movement of Cuba’s humble were intertwined with each other to the extent that each one was indistinguishable on its own. He succeeded on this path further than anyone else from the 1940s until October 11, 2016, the last time his words were published. Finally, though, Fidel had the last word on November 25, 2016 when Cuba – a small, blockaded Third World country that had only 56 years earlier broke the shackles of 500 years of colonialism and imperialism – took centre stage in the world, leaving no one, friend and foe alike, indifferent to this giant of theory and practice. In the long life and work of Fidel Castro, there was never a breach between thinking and practice: they were one. This legacy, universally applicable, is now part of humanity’s path for progressives, left-leaning people and revolutionaries to follow.